Vibe are consistently establishing their position at the forefront of product innovation within the ICE industry. The new Slick speaker range is no exception to that rule, with outstanding acoustic innovation and advanced design technology. The Slick speakers certainly live up to their name, Slick style with Slick performance. They have designed these speakers to deliver up power in true Vibe fashion. You can expect sharp, tight bass sounds thanks to the stiffened IMPP cone and hard PU surround incorporating Fastbass™ technology. The Slick speakers are a 2 way coaxial configuration which enables the Slick speakers to have shallow euro fit baskets with wider but shallower magnets for maximum ease of installation where space is tight allowing the speakers to be installed into virtually every vehicle on the market today. 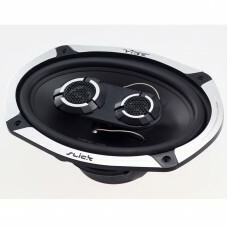 All Slick speakers feature a new bigger, oversized PowerTweeter™ able to deliver powerful sharper mids and treble.